Citation Information: J Clin Invest. 2018;128(10):4387-4396. https://doi.org/10.1172/JCI99005. Activation of HIV-1 reservoirs and induction of anti–HIV-1 T cells are critical to control HIV-1 rebound after combined antiretroviral therapy (cART). Here we evaluated in humanized mice (hu-mice) with persistent HIV-1 infection the therapeutic effect of TLR3 agonist and a CD40-targeting HIV-1 vaccine, which consists of a string of 5 highly conserved CD4+ and CD8+ T cell epitope-rich regions of HIV-1 Gag, Nef, and Pol fused to the C-terminus of a recombinant anti-human CD40 antibody (αCD40.HIV5pep). We show that αCD40.HIV5pep vaccination coadministered with poly(I:C) adjuvant induced HIV-1–specific human CD8+ and CD4+ T cell responses in hu-mice. Interestingly, poly(I:C) treatment also reactivated HIV-1 reservoirs. When administrated in therapeutic settings in HIV-1–infected hu-mice under effective cART, αCD40.HIV5pep with poly(I:C) vaccination induced HIV-1–specific CD8+ T cells and reduced the level of cell-associated HIV-1 DNA (or HIV-1 reservoirs) in lymphoid tissues. Most strikingly, the vaccination significantly delayed HIV-1 rebound after cART cessation. In summary, the αCD40.HIV5pep with poly(I:C) vaccination approach both activates replication of HIV-1 reservoirs and enhances the anti–HIV-1 T cell response, leading to a reduced level of cell-associated HIV-1 DNA or reservoirs. Our proof-of-concept study has significant implication for the development of CD40-targeting HIV-1 vaccine to enhance anti–HIV-1 immunity and reduce HIV-1 reservoirs in patients with suppressive cART. 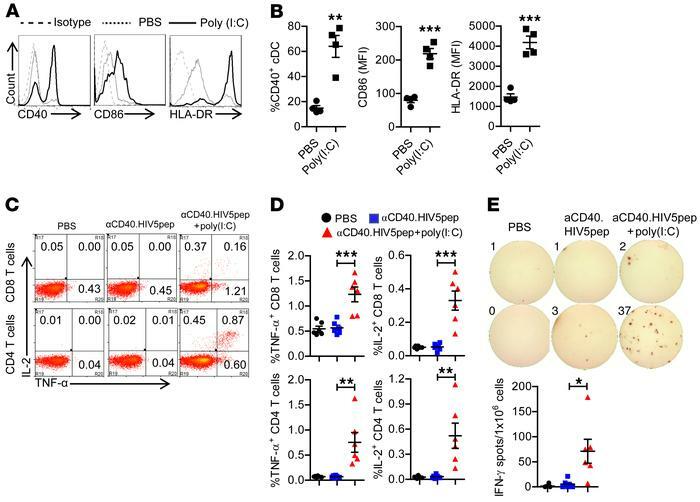 Poly(I:C) enhances αCD40.HIV5pep vaccination to induce both human CD8+ and CD4+ T cell responses in vivo. (A and B) Hu-mice were treated with poly(I:C) (50 μg/mouse, i.p.) or PBS as control. Leukocytes from spleen were isolated for flow cytometry analysis 24 hours after treatment. Representative histogram (A) and summary data (B) show the expression of CD40, CD86, and HLA-DR on mDCs (hCD45+CD3–CD19–CD14–CD11c+) after treatment. (B) Representative data from 4 hu-mice per group with mean values ± SEM of 3 independent experiments. **P < 0.01, ***P < 0.001 by unpaired, 2-tailed Student’s t test. (C–E) Hu-mice were vaccinated with αCD40.HIV5pep with or without poly(I:C) and boosted at week 3. Mice were euthanized 10 days after the boost vaccination. Splenocytes from mice were stimulated ex vivo with the corresponding 5 specific HIV-1 long peptides plus αCD28 mAb. (C and D) IL-2 and TNF-α expression by CD8+ and CD4+ T cells were detected by intracellular staining. Representative plots (C) and summarized data (D) show percentages of IL-2– and TNF-α–producing CD8+ T cells CD4+ T cells. (E) IFN-γ production was detected by ELISpot assay. (D and E) Combined data from 2 independent experiments with mean values ± SEM (PBS, n = 6; αCD40.HIV5pep, n = 6, αCD40.HIV5pep + poly(I:C), n = 6). *P < 0.05, **P < 0.01, ***P < 0.001 by 1-way ANOVA and Bonferroni’s post hoc test.